Many homeowners are not aware of the many benefits associated with topdressing a lawn. But there are so many benefits it is hard to understand why it is not the foundation of every good lawn care program. A good top dressing improves the soil biology by adding organic matter and beneficial microorganisms. Topdressing the lawn reduces stress, evens out unlevel areas, helps break down thatch, and acts a a natural fertilizer. So with all these benefits why is it not a more popular service? The answer is likely because it is a very labor intensive practice that requires a lot of shoveling and spreading the topdressing across the yard. Topdressing is most effective when it is combined with other services like core aeration and lawn fertilization and weed control. Those 3 services combined are the ideal trio of lawn care practices that will result in a healthier lawn. The aeration service opens up the soil, allowing for better air and water movement and reduced compaction. The aeration holes provide the perfect place for fertilizer to reach the roots, and the topdressing fills the holes creating the perfect environment for a thick lush green lawn. 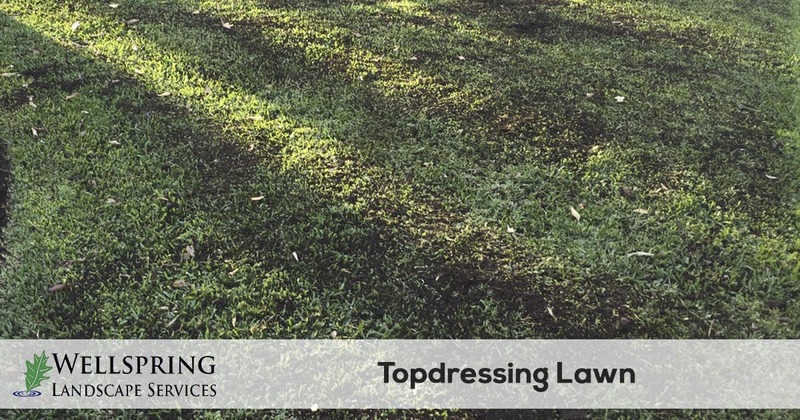 Whether you need to have areas of your lawn leveled out or you are considering core aeration and overseeding services for your yard, then topdressing your lawn is a good decision. Wellspring Landscape Services offers topdressing services in Austin, Bee Cave, Lakewood, Rollingwood, and the Westlake Texas area. Get your free quote today!